Although single-ply roofing is used primarily on commercial and industrial flat roofing projects, it is becoming a popular roof covering on low slope porches and dormers on residential homes. The hottest item in the single-ply market is ethylene propylene dyne monomer, or EPDM. Long-term dependability, weather resistance, and durability are among the primary factors contributing to the rapidly increasing demand for EPDM roofing systems. Team Vinyl and Roofing offers RPI's™ fully adhered single-ply rubber roofing system. RPI's Royal Edge .060 EPDM is a tried and true solution to your flat and low slope roofing needs and available in a variety of lengths and sizes. RPI's Royal Edge Black EPDM comes with a free MFG 40 year membrane warranty, which is the longest rubber roof system warranty in the industry. Seen on many of the older homes and barns in the northeast, slate was the roof system of choice as it is considered virtually indestructible and sheds snow. Slate comes in many different colors and grades depending on its origin. While virtually indestructible, slate roofs are more expensive than other roofing materials and their installation requires skill and experience. 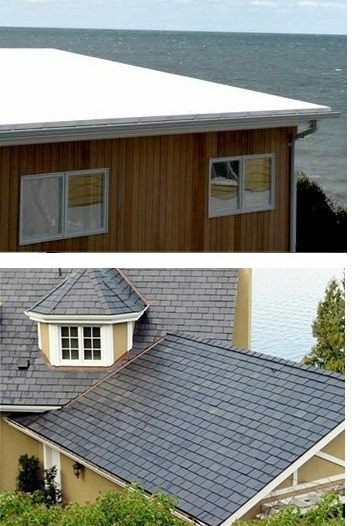 Team Vinyl and Roofing has experienced roofers skilled in the installation and repair of slate roofing. Team Vinyl and Roofing also understand the loyalty New Englanders have to their slate roofing. If you need your slate roof repaired, or would like to participate in our annual inspection program, please contact us.